On October 25, the University of Connecticut Communication Society attended an exclusive networking opportunity with Gaffney Bennett, a public relations firm in New Britain, Connecticut. Gaffney Bennett Public Relations (GBPR) focuses on strategic communications services to over 84 clients including Connecticare, Eversource Energy, and NBC Universal. Their mission is to “help clients tell their stories” through detailed communication campaigns that will reach the client’s target audience. This is done by working with clients on improving media relations, crisis communications and management, market entry campaigns, video content creation, issue management, and social media platforms. The event was a business casual luncheon in which Comm Society students were able to get a behind-the-scenes look at how public relations firms function. After the Comm Society students were seated, five staff member representatives spoke about their post graduate experiences that brought them to the positions they hold today. The visiting members of GBPR highlighted that all of their different career paths were attainable under the umbrella of a communications degree. Each person’s experience gave the students a glimpse into what working in public relations can offer from internship, event planning, journalism, agency, and corporate lenses. With nine years of experience in the field of public relations, Justin May, the Vice President of GBPR, led most of the discussion. As a graduate from the University of Connecticut, May uses his writing skills to market his communications campaigns to the wide range of clients that GBPR acquires. Other employees of GBPR informed the Comm Society about their positions, and how their careers have led them to have different experiences as PR professionals. All of these diverse backgrounds gave Comm Society members a chance to see the different roles an employee in public relations can have. After learning about some of the GBPR staff, each member of Communications Society had the opportunity to discuss their experiences with communications and their future aspirations in the field. This was followed by a Q&A panel in which students could ask questions about GBPR or public relations as a whole. Before leaving GBPR the students and staff were able to exchange brief dialogue and express thanks for the interest and opportunity to network. Networking is important, not only for internships and jobs, but also for gaining valuable insight towards what others in the field have experienced. For Comm Society, being able to visit a public relations firm provided them with exposure to the real world that is unparalleled in the classroom. Not only were they able to gain some insight on what a public relations firm does, but they were able to make connections along the way. 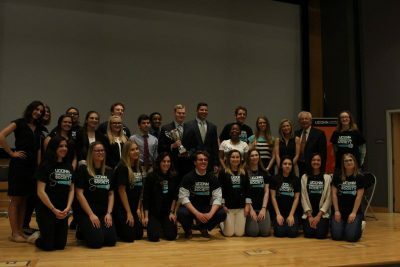 Communications Society extends its thanks to Gaffney Bennett Public Relations for opening its doors to eager students hoping to influence the field in the near future. For more information about the UConn Communication Society, visit their website or email uccommsociety@gmail.com.